Let’s get it. Tuesday was a bright day of tefillot, chug (elective), schiya (swim), and kitah (class) in the morning, with some basketball in the afternoon for the banim (boys) and lap tag for the banot (girls). One quick shower later, we were sitting in the Ben Tzvi together to watch the Kerem (CITs and oldest aydah (age group) in camp) perform their play for the year–Aladdin! We sat, almost as if in a “Whole New World,” as we felt like “We ‘Aint Never Had a Friend” like those around us at Yavneh and in Leviim. We went back to the tzrifim (bunks) feeling like Prince Ali and Princess Jasmine. We personally felt like Raja the Tiger, but that’s just us. Wednesday was achla yom (literally “awesome day,” a day every week with an extra fun activity). As a side note, every day is feeling pretty achla, but you probably want to hear what we did that day. We woke up late and did some more practice for Zimriyah (the singing competition that is happening TODAY!!) before going to see Minions. We spent the afternoon doing some more Zimriyah prep before an awesome afternoon of paint games! Our minds and thoughts were as colorful as our shirts as we went to shower up before dinner. The barbeque was great as always, with steaks, burgers, dogs, and some black bean burgers for the tzimchonim (vegetarians). We ended the night with some improv games and the last prep before Zimriyah. And so it is. Tonight, the gloves come off and we will show that we are the very best, like no one ever was. 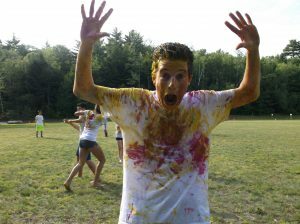 Tune in tonight for Zimriyah at 6:30 pm at www.campyavneh.org/streaming! 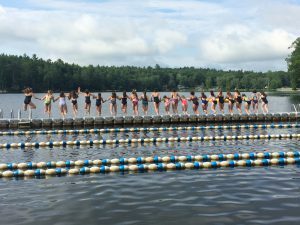 For those parents of first month chanichim (campers), this is the last blog post you might be seeing this summer. Thanks for reading, and we’ll see you all on Sunday!